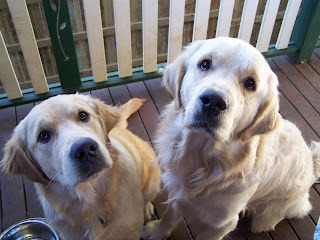 I must confess there are 2 other guys in my life - our 2 Golden Retrievers - Yuki and Sabo. They are both 3 years old. Yuki is possibly the largest Golden Retriever ever - well he's the biggest I've ever seen and my family has so far owned 5 Goldens. Anyway he is blond and athletic (2 things I am definately not) and suffers from eldest child syndrome (he still remembers when he was the one and only and wishes it could be that way again). Sabo is small, nuggety and a bit obsessive. Sabo has baby dog syndrome with a healthy portion of OCD. Anyway they are the 2 other guys in my life and will henceforth be referred to as 'the boys'.